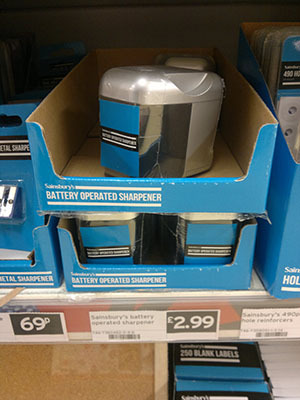 Tesco, a British supermarket chain, is currently selling a battery operated pencil sharpener for £ 3 (~ € 3.30). The sharpener is part of the “Tesco range”, which previously included very good stationery …like their pencils made from paper. Unfortunately some of these good products have suddenly disappeared in the last weeks, so I thought I should buy one of these sharpeners before it is too late. 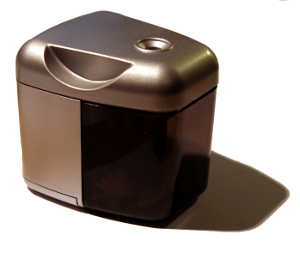 The sharpener is available in silver and black and looks quite “plasticy”, but the design is not bad. If you look closer you see that the mould and the paint could have been done better, but for a product in this price range the appearance and workmanship is good. For those who do not know Tesco: this is typical for products from their own range, be it LED torches, padlocks or any other non-food item. The sharpener is made in China and operated by 4 AA batteries. The languages on the labels suggest that except in the UK and Ireland the sharpener is also sold in Poland, the Czech Republic, Slovakia, Hungaru and Turkey. As usual batteries are not included, but to my surprise the sharpener comes with an extra blade. This is very good news as the blade seems to be of very good quality, but more on this later. 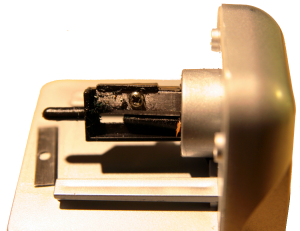 When you remove the shavings container you can see that the cutting unit inside resembles a manual sharpener that is rotating when a pencil is inserted. You will also find the replacement blade there, held by sticky tape. The cutting unit itself seems to be plastic mounted. Similar to other battery operated sharpeners, like the Staedtler Mars Desk battery operated pencil sharpener, the Tesco sharpener will not work if the shavings container is removed. I assume that the model number is 94g, as 94g is printed on the label and the weight of the sharpener (without batteries) is a bit over 140 grams, certainly not 94 grams. That said, if you put the Hungarian text from the label in Google Translate it comes up with “Weight: 94g”, so either the label was made for an earlier, lighter version of the sharpener or the translation is wrong. Whatever the standard deviation for weight of this sharpener is, I rule out that my sharpener is 50% heavier than it should be and that my scales are that inaccurate. The sharpener itself works very well. You have to hold the sharpener, otherwise the sharpener will rotate around the pencil. It is also moving rather fast, so you have to pull the pencil out fairly quickly if you want to avoid using it up unnecessarily. The blade of my Tesco sharpener works extremely well for a sharpener of such a low price. It does certainly not perform as well as a great sharpener, like the grenade from Möbius & Ruppert, but it performs much better than most average sharpeners. The wood and the lead have a smooth surface when sharpened with the Tesco sharpener, which is not common with cheap sharpeners, but there is some rough scraping of the wood, sometmies in the form a visible line where the blade stopped when the pencil was removed. One problem I noticed is that the often resharpened pencils tend to be sharpened more on one side than the other (see picture). It could be a coincidence or the fact that the speed of the Tesco sharpener made me sharpen often but little, reinserting the pencil with the previously shaved side towards the blade. Altogether this sharpener offers great value for money. Assuming the blade is this good in the other “94g” sharpeners they are certainly worth buying. I noticed that Tesco raised the price to £3.30 and that Sainsbury started selling the same model for £2.99. So the sharpener works with a rotating manual sharpener, i. e. one with a blade? If yes: Is is equipped with a standard blade that can be replaced? Yes, there is a rotating manual sharpener inside, I should have mentioned this fact explicitly. The blade looks pretty standard and can be replaced. The blade from a Staedtler 510 50 or from other sharpeners of this size should fit. That’s great – a non-replaceable blade would render the device unsuable as soon as it is blunt. Another question: How is the cutting unit mounted? Does it rotate on a plastic pin or is there some kind of metal bearing? The cutting unit seems to be plastic mounted, the blade is held by a metal screw. I’ll be cheeky and add the answers to your questions to the original post, as this would provide useful information …especially for those who do not look at the comments. I must say that this page of yours is an excellent find for me. I was just surfing and discovered this. Thanks. Diane: Thank you very much for your kind comment. There are lots of battery powered sharpeners out there that will get the job done.